Today, September 16, 2010, was a very special day for me. This morning just before 11 o’clock, with a handful of my friends looking on, I was baptized in the tradition of my faith. 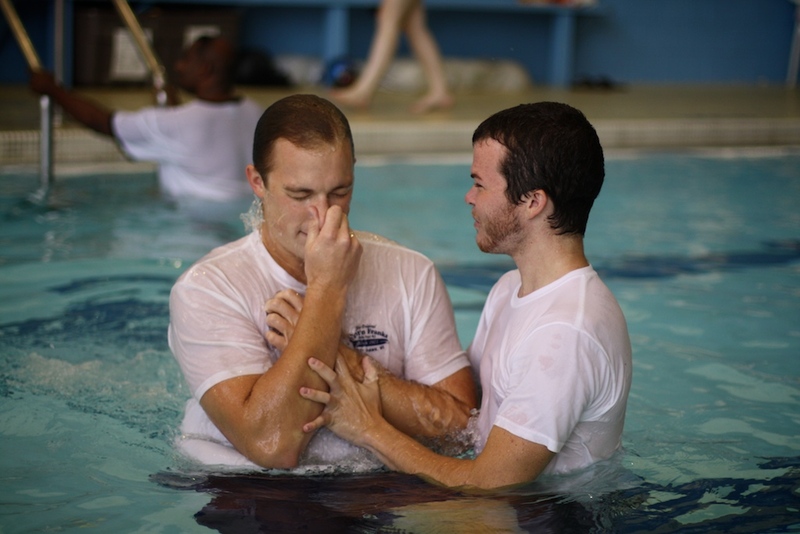 Then, before I had time to really process the moment, I was baptized again. Hopefully persistence counts for something. The scene might have been a little odd to passersby, but it was a great experience for me and my fellow Divinity School students. 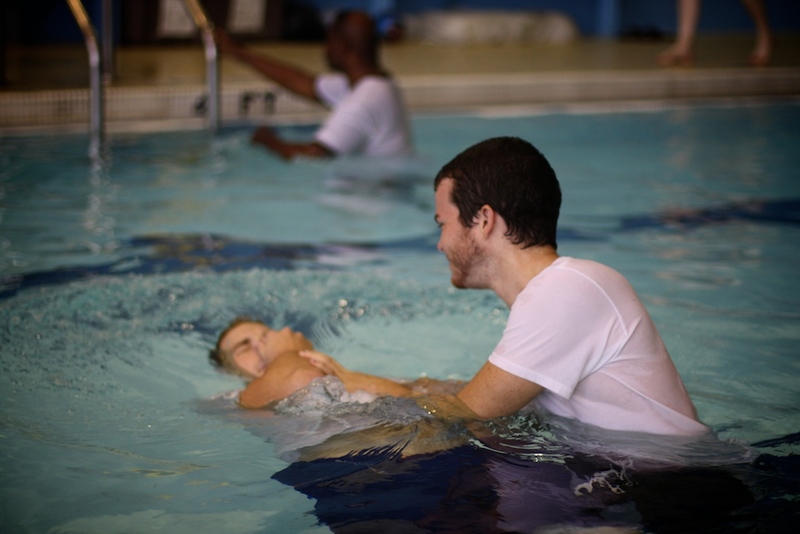 Understanding the purpose and practice of baptism is included in the curriculum for our Life and Work of the Minister course, and practicing baptism means getting in the water. The mission statement of Campbell Divinity School is “to provide Christ-centered, Bible-based, and Ministry-focused theological education.” These three elements are represented, to some extent, in every course the school offers, but the three-fold purpose also guides, in a larger perspective, the multi-facted approach of the entire Master of Divinity program. Most of the courses required for the M.Div. degree can be classified as either a spiritual development course, a course in classical theological education, or as a practical, vocation-driven course. Balancing these three aspects of theological education really allows students to grow spiritually and academically as they work to discern God’s call on their lives, and it is something Campbell does very well. It’s amazing how my experiences in and outside of the classroom continue to build on each other. Just last week, in Church History I, our discussion was focused on the baptismal practices of the early church. 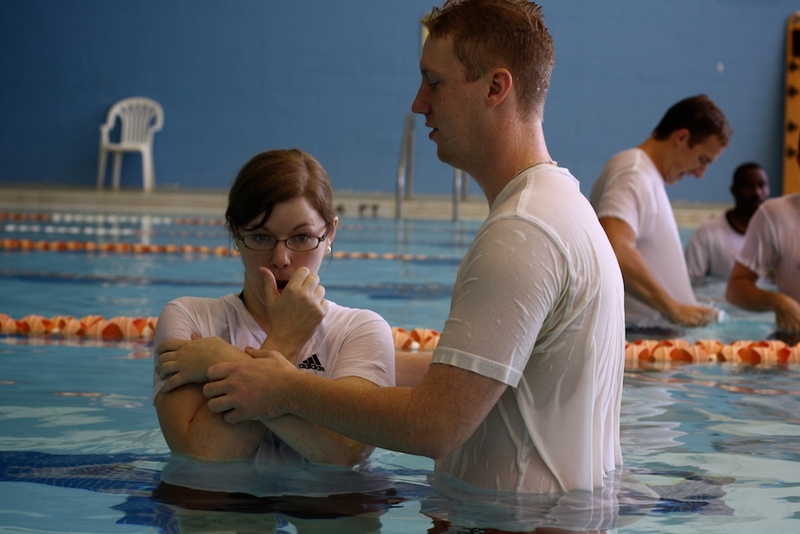 Very quickly in the life of the early church, baptism became such an important part of the spiritual development process that a waiting period of at least three years was implemented for catechumens in order to give them sufficient time to contemplate their own faith experiences and develop healthy practices of discipleship that would allow them to contribute to the church once they became full members. Understanding this influenced our discussion on the spirituality and theology of baptism in Life and Work of the Minister. With this discussion still fresh on our minds this morning, we waded into the water to practice the practical aspects of baptism before we are called on to lead a formal baptismal service. The M.Div. degree at Campbell is really almost like three degrees in one — and at 90 hours, it often feels like enough work to earn three separate masters degrees — but there isn’t anything else I’d rather be doing at this point in my life. Having professors and peers that I know are genuinely concerned about my spiritual growth is an indescribable blessing. Having courses that keep me challenged academically makes every day fresh and exciting. 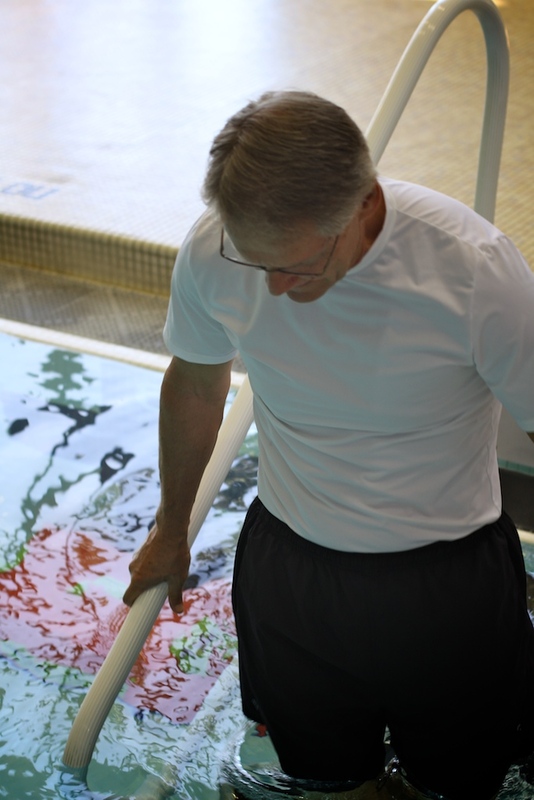 And besides, where else could I go to get my feet wet, knowing all the while that a quick hand is there to catch me if I slip off into rough water? If someone thinks he has good reasons to put confidence in human credentials, I have more. … But these assets I have come to regard as liabilities because of Christ. More than that, I now regard all things as liabilities compared to the far greater value of knowing Christ Jesus my Lord, for whom I have suffered the loss of all things — indeed, I regard them as dung! — that I may gain Christ, and be found in him, not because I have my own righteousness derived from the law, but because I have the righteousness that comes by way of Christ’s faithfulness — a righteousness from God that is in fact based on Christ’s faithfulness. My aim is to know him, to experience the power of his resurrection, to share in his sufferings, and to be like him in his death, and so, somehow, to attain to the resurrection from the dead. We have talked a lot about “call” during my first semester at Divinity School. At the beginning of my course with Dr. Michael Cogdill, we focused on the call of Paul, also called Saul.¹ Paul is often used as an example of a person who made a radical change of direction — a complete 180º — in his decision to follow Christ. The phrase “she had a ‘Damascus Road experience,'” referencing Paul’s encounter with the resurrected Messiah on his way to Syria, is common vernacular today. Indeed, considering Paul’s position when he left Jerusalem — “I do not believe Jesus is the Christ” — compared with his stance once he arrived in Damascus — “I do believe Jesus is the Christ” — it is fair to say that he made a total change. A broader look at Paul’s life, however, shows that perhaps this change wasn’t as sharp as it initially appears to be. Paul had always had a deep desire to know more about God. Although he worked as a tent maker (Acts 18:1-3), not a religious professional, Paul devoted his time to studying the faith and the ancient scriptures. He became a student of Gamaliel (Acts 22:1-3), the most accomplished teacher of his day. Saul wanted to do all he could to please God and serve him, so he joined the Pharisees — a religious-political sect of Jews that followed the rules of their faith, as they understood them, in the strictest sense possible, holding each other accountable along the way. Even among the Pharisees, Saul’s desire to follow the will of God and serve him was unsurpassed (Galatians 1:13-24). Saul had spent his life studying the scriptures and prophets and knew them as well, or better, than anyone else of his generation. He was a Roman citizen² (Acts 22:22-29), but he had already decided that following God and serving him was more important than focusing on building a career and amassing money. He valued education, he paid attention to the secular philosophies of his day (Acts 17:16-31) and he valued a hard days work. Above all else, however, Saul was committed to serving God, although his understanding of God had been skewed by his narrow focus (Acts 7:51-8:3). Clearly, Saul was the perfect person to lead the effort of spreading the message of Christ to the world. He had the knowledge, he had the credibility, he had the resources, and above all, his zeal for serving the Lord was unmatched. He just didn’t quite understand what it was God wanted from him.³ Meeting Christ has a way of bringing clarity to things. In the same way, whenever we find ourselves at a point of conflicting values — when a dilemma of ethics seems to permeate a decision — studying the life of Christ is the best method for clearly judging a right course of action. Understanding Paul’s life in this way — recognizing the fact that his love of God and his desire to live a life of service did not begin on the Damascus Road — poses a tough question for Christians today. How do we deal with fundamentalists from other faiths? Can we condemn them for holding fast to what they “know” to be true? Caught in this situation, even as he was being stoned, “Stephen prayed, ‘Lord Jesus, receive my spirit!’ Then he fell to his knees and cried out with a loud voice, ‘Lord, do not hold this sin against them! '” (Acts 7:59-60). Following Jesus isn’t easy, but as Paul found out, it’s worth the cost. 1. Contrary to tradition, Saul’s name was not changed following his encounter with Christ. The biblical record shows that he continued to be called by both names after his profession of faith. Like many Jews at that time, Paul kept his Hebrew name (Saul) but used a Greco-Roman name (Paul) in common circles. Considering his zeal for Judaism, and the fact that accounts of his early life are generally concerned with his involvement in the faith, before his conversion to Christianity his Hebrew name was used most frequently. 2. Paul received his citizenship through inheritance, which was an unusual thing at a time when most people living under the rule of Caesar were not considered citizens. This indicates that Paul was likely from a wealthy family of considerable influence. I simply can’t believe I’m already approaching mid-terms during my first semester of divinity school. My classes have challenged me academically and spiritually, but most of all I’ve come to a fuller appreciation of God’s love for us. I’ve especially enjoyed my studies of the Old Testament with Dr. Tony Cartledge. In my experience, Christian devotions and church studies tend to focus almost exclusively on the New Testament, relegating a few key passages from the Old Testament into children’s Bible stories. While Christians rightly look to the teachings of Jesus, Peter and Paul as the latest revelation of God’s truths, an unfortunate side effect is a trend toward a lack of biblical knowledge among adult Christians. The Old Testament still has much to tell us about human nature and our relationship with the Eternal God of Abraham, Isaac and Jacob. Jesus was a student of the Old Testament. He diligently studied the stories of Moses and the prophets, meditated on the word of the Lord and used the scriptures to proclaim his message of salvation in the synagogues and side streets. Had he simply been born with a photographic recall of the scriptures, he would not be able to sympathize with us as we struggle through our studies today. Likewise, a solid understanding of the Old Testament scriptures is imperative to fully understanding the teachings of Jesus. The conversation between Jesus and the Pharisee Nicodemus recorded in the Gospel of John is probably the most oft-quoted passage in Christian circles, summing up the core message of salvation in a single verse or two — we are redeemed by the sacrifice of Jesus alone, the ultimate example of God’s love for creation. All we have to do is have faith. Jesus spoke these words to Nicodemus, who, as a member of the Jewish ruling council and a student of scripture himself, already knew something of the power of faithful obedience to God. The other members of the Sanhedrin felt threatened by Jesus and had begun plotting against him, but Nicodemus recognized something very special about him. (Their entire conversation can be read here.) This reference to the Old Testament story of the Nehushtan may have seemed baffling at first, but Jesus mentions it for a specific reason. The Nehushtan, or snake-on-a-pole, was a symbol of God’s healing grace, of his mercy and love for his people. With images of God’s miraculous show of force against the Egyptian Empire still fresh on their minds, the Israelites were wandering in the desert, under the guidance of Moses, in search of the land YAHWEH had promised them. They had had ups and downs, but time and time again, God had proven that so long as they remained obedient and fearful of him, they would be protected and provided for. In fact, the Israelites had just won a tremendous victory over the hostile Canaanites who had been terrorizing them. Appropriately, the Israelites gave YAHWEH the credit for their victory. While their shouts of victory and praise were still hanging in the air, however, the Israelites began to grow discontent, speaking out against God, complaining to their leader Moses and reminiscing about the good-ole days when they were content and happy slaves in a foreign land. Then the snakes came. Slowly at first. Slinking out from under the desert rocks and leaving their mark on the careless men who got too close. Then more came. They were everywhere. It seemed no one could avoid being bitten. Perhaps they shouldn’t have been so quick to turn their backs on the Lord who had delivered them from Egypt, cared for them in the desert and thwarted the attacks of the Canaanite king. What to do now? Would the Creator of the Universe take them back under his wing, yet again? So Moses prayed for the people. The Lord said to Moses, “Make a snake and put it up on a pole; anyone who is bitten can look at it and live.” So Moses made a bronze snake and put it up on a pole. Then when anyone was bitten by a snake and looked at the bronze snake, he lived. So once again, God’s people recognized their own insufficiencies and turned to him. Once again, he redeemed them. He didn’t do all they asked for, though. The people wanted God to remove the snakes from the land. They wanted him to eliminate pain and suffering from their world; To give them a carefree life. God knew if he simply took away the snakes — if he removed the cause of hurt and trouble in the world — he would also be taking away the freedom of his people. He would be infringing on their freewill and they would no longer be able to turn to him and seek him out of their own volition. No. That was out of the question. What he did do, though, was provide a way to ease their suffering. He offered them a way out, but they would have to choose to accept it individually, and on faith. The Messiah, Jesus, understood his mission was to become a similar vehicle for God’s love, but in a much more profound way. He must still be shamed and put on display for the people to see, but when we look upon him in faith, we are healed completely. We are made new. He doesn’t just remove physical toxins and pain that would cause us harm; he purges the blemishes of our soul, forgives us our sins and gives us new life, eternal life, in him.